If you want the health and relaxation benefits of a traditional sauna but without having to dedicate a lot of space for it and not to mention costs of a standard sauna, then a portable sauna might be the solution for you. The unique portability of a mobile sauna allows you to be able to set up anywhere in the house you want, and pack it up after you have finished with it. Portable or mobile saunas are ideal for athletes / sports people who travel a lot and can easily set up the sauna in their hotel room. Or for people with muscle injuries or other body pain that would require them to be able to use their sauna daily. The portable sauna kit is great for taking on vacations or trips, so you don’t miss a day without the therapeutic relief and relaxation you get from a sauna. They may look big and clunky but these saunas are very light weight as they are made from a durable fabric that can be folded down into a very small package and carried in a suitcase or hand luggage. Mobile saunas make it possible for people who have very limited space to enjoy the benefits of a sauna. You may not have the space for a standard wooden sauna in your house or apartment, so a portable sauna that can be used in small spaces and packed away once you are finished with it, is ideal. The costs of a portable sauna is much cheaper than a traditional hemlock constructed sauna, both in price and in running costs. 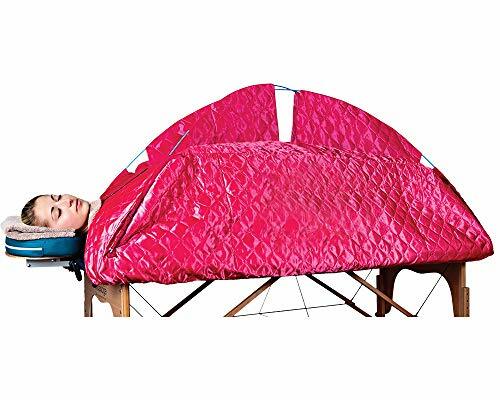 A good quality portable sauna can be the perfect solution to the needs of any beauty or massage therapist. Perfect for use in the home or salon, the BSA6310 Rejuvenator Portable Sauna from Radiant Saunas is an excellent choice for anyone wishing to provide a versatile and efficient sauna treatment to their clients. The BSA6310 Rejuvenator features a lock-stitched canopy, manufactured from a high-quality polyester satin fabric that is both durable and moisture resistant. The sauna canopy also features a triple-layered design, including a cotton insulation layer and reflective polyester inner lining. All of this helps to ensure that the sauna is fully insulated, providing excellent heat circulation and a great sauna experience to the user. 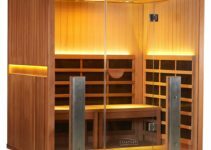 One of the outstanding features of this sauna that truly sets it apart from the competition is its high-end heating system, which includes features more commonly found on some of the more expensive fixed saunas. This comprises of an energy efficient low EMF carbon fiber heating panel, which is 3-ETL approved and a built-in thermostat with a maximum operating temperature of 150 degrees. The sauna also features six automatic timer programs and an auto shut-off system, putting the safety of your clients first. This essential safety feature is becoming increasingly popular these days, and it’s excellent to see Radiant has incorporated this important technology into this portable model. Another sign of the excellent quality of this portable sauna is its sturdy beech hardwood dowel frame. Already pre-attached to the unit, the frame support system can be set up quickly and easily, with no additional tools required. This makes the BSA6310 Rejuvenator fully portable, allowing the sauna to be completely folded up for storage or transportation between the homes of clients. With five temperature pre-set options included and a remote temperature and timer control, the BSA6310 Rejuvenator ensures that sauna treatments always remain comfortable and effective for your clients. The sauna even includes a padded sponge floor-mat, padded double-lined neck collar and foldable chair for an added sense of luxury and comfort. The spacious design of the sauna cabin also means that users have plenty of room inside to stretch out and relax with ease. When it comes to selecting a portable sauna, versatility, ease of use and quality are always at the top of a buyer’s list. With it’s ingenious fully-collapsible and foldable canopy, which allows the user to disassemble the sauna without needing to dismantle it completely, the Portable Therapeutic Steam Sauna by Steamflex has revolutionized the market. 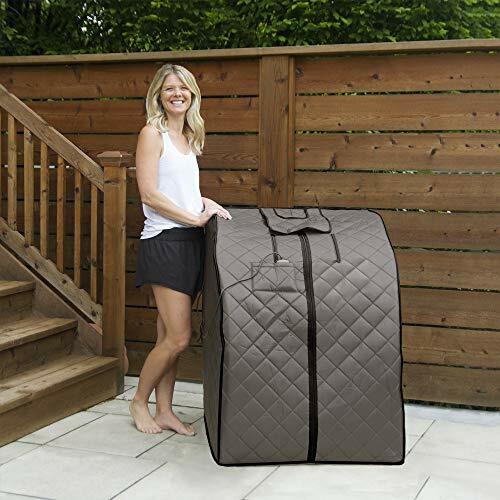 This means that the sauna can be easily collapsed and folded away into its handy carrying bag in just minutes and is ideal for use within the home environment. If you are a mobile therapist carrying out regular treatments within a client’s home, you need this sauna. Alternatively, the Steamflex is also ideal for massage therapists who wish to integrate a relaxing and rejuvenating sauna into their regular massage routine, as the sauna also fits most standard sized massage tables. The sauna also comes supplied with a water-resistant table cover, making it a perfect sauna solution to any health spa or beauty salon. In addition to this, the Steamflex is also large enough to cover a client entirely from head to toe. 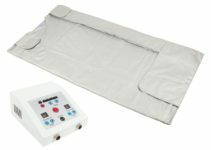 It’s even large enough to allow a client to turn over, making it perfect for use with a wide range of beauty treatments, such as detox, exfoliation, and body wraps. With its lightweight canopy and flexible fiberglass rod construction, the Steamflex is very easy to move around. Manufactured from high-quality material and weighing less than ten pounds, the sauna canopy is easy-to-clean and folds quickly and neatly into it’s supplied carrying bag. With it’s remote-controlled portable steam generator and digital alarm thermometer, it’s also easy to maintain the desired temperature to keep your client feeling relaxed and comfortable in this excellent portable sauna. It is important to note that the Steamflex has been designed for use by qualified therapists and their clients only. Always ensure that the sauna is set to the correct temperature and that the person receiving the treatment is adequately hydrated. For safety reasons, the client must not be left unattended in the sauna at any time. The sauna also must not be operated by the person who is receiving the treatment. 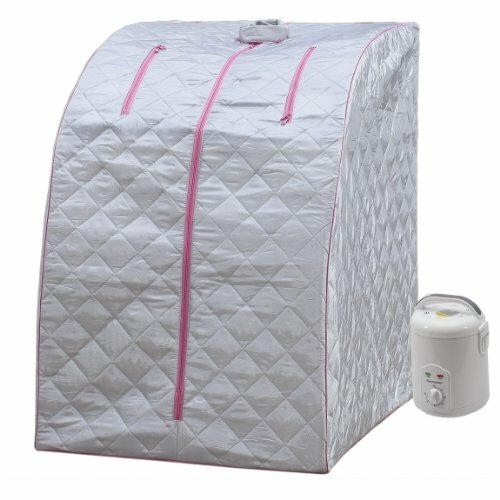 For a portable sauna the Portable Therapeutic Steam Sauna is a roomy size (28″ x 33″ x 43″) making it a great option for all body types. It comes with a convenient timer that can be set to anywhere from 10 minutes all the way up to a full hour. The included generator holds a generous 1.8 liters and transmits 800 watts of power ensuring that your personal tent completely fills with steam so that you get the full sauna effect. The sauna runs on 120 volts so can be used in any regular outlet making it perfect for travel or home use. You’ll be surprised how well this thing works, but just note that you’ll need to have a chair or stool to put in the unit, as it doesn’t come with a seat. If you’re wanting a portable sauna that still offers some of the more high tech heating elements that larger standard saunas offer then this portable sauna will work for you. The Durherm Far Infrared Portable Sauna was created for users just like yourself. You want the great appeal of a larger sauna but the convenience of a portable sauna. This sauna includes a Far Infrared heater box with a super conductive ultra-thin carbon fiber heating element. This sauna has a roomy design that will allow you plenty of room to read, watch TV, or listen to music as you enjoy your sauna. The sauna box includes additional negative ion far infrared carbon fiber heating panels with temperature preset controls so that you can set your own personal heat level. There is an included hand held controller to change easily change the temperature and timer. 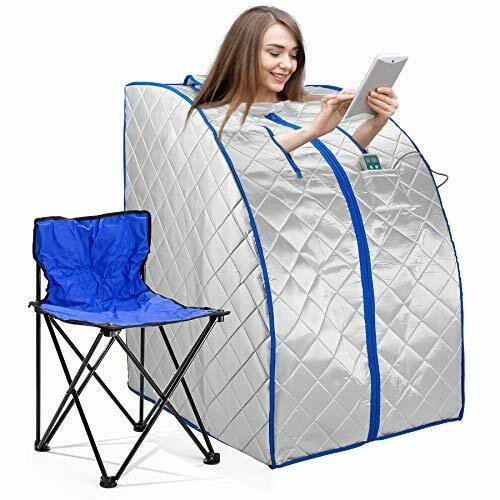 This sauna comes with its own compact folding chair, a foam floor cushion, and easy to use zippers at the entrance and the arm holes for ease of use.